Shiloh Run Press, 9781683220091, 384pp. The Heart-Shaped Life Daily Devotional provides refreshing thoughts, prayers, and scripture selections to help you discover the best path to the good life. . .which is all about LOVE! Karen Moore has an M.A. in Education and is a writing coach, speaker, and author. Karen has held managing editor and publisher positions at David Cook and Thomas Nelson, as well as American Greetings and Gibson Greetings. She teaches an online course in greeting card writing. She is also a popular speaker at writing conferences around the country and is the author of more than seventy-five gift, devotional, and children’s books. She lives in Nashville, Tennessee. “As someone who enjoys the spiritual pause a daily devotional offers, I have gone through several over the years. Many ask the reader to take a step back and look at their lives in a more spiritual way. 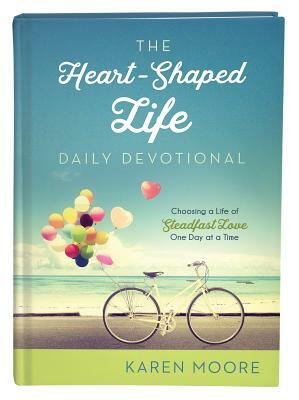 The Heart-Shaped Life Daily Devotional does something different, though. Rather than urging a step backward, Karen Moore invites the reader to move forward in leaps and bounds by remembering and then activating the blessings God has in put in place for all believers. “Karen's writing style is like getting a daily letter from a friend who already knows my life's struggles and challenges. She knows just the right thing to say to keep me encouraged and focused on what it takes to live a heart-shaped life. “For me, the ultimate test of a devotion though comes when reading today's inspiration makes you look forward to tomorrow's. —Tom Ziglar, Proud Son of Zig Ziglar, President of Ziglar Inc. The Heart-Shaped Life is easy to understand and easy to apply. Encourage shoppers to keep it by their bed or their favorite reading spot. Any woman looking for a quick infusion of hope and truth will enjoy this daily read.